St. Petersburg: Prospectus the Neva, orientem versus aditus que in Galeram Petroburgae. - Vista de la Neva, Hazia el oriente, entre el lugar de las Galeras a Petersbourg. Old, antique print of St. Petersburg. View of the Neva, in the direction of the arrangement that is on the east side of the Galeria Petroburgum. Remondini, around 1780. Right-sided copy of a in 1753 in the Kaiserl. 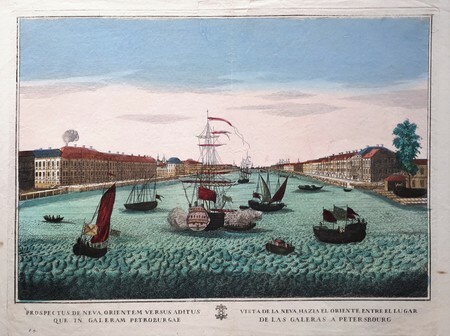 Saint-Petersburg academy published engraving by Ivan Petrovic Eljakov after a model by Mikhail Ivanovic Machaev, but Remondini has probably copied the leaf illustration of Probst. The view shows the large Neva with a view to the east, on both sides long rows of buildings, on the left on the Vasilyevsky island, right in the city center, with a rich ship staffage. Original colored copper engraving. Optical view print.